BRASILIA, May 28, 2018 (BSS/AFP) - Brazil's President Michel Temer, under pressure from a week-long national truckers' strike, said Sunday he was cutting the cost of diesel by 46 Brazilian cents a liter. The cut was to be frozen for 60 days, the president said in televised remarks, as the strike paralyzes much of the country's economic infrastructure. 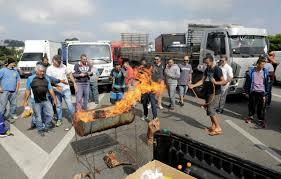 Temer also agreed to four other demands truckers made. "We have done our part to ease the problems and suffering," Temer said in an eight-minute address, mentioning that he heard reports that millions of animals could die of hunger if the crisis did not ease. The average price of diesel was 3.36 reais (92 US cents) in January and rose to 3.6 before the strike, according to news portal G1. On May 26, it hit 3.8.